Location: Connemara, County Galway, Northern Ireland. Built: Construction first began in 1867. Ownership / Access: Open for public tours and 'nature' walks. 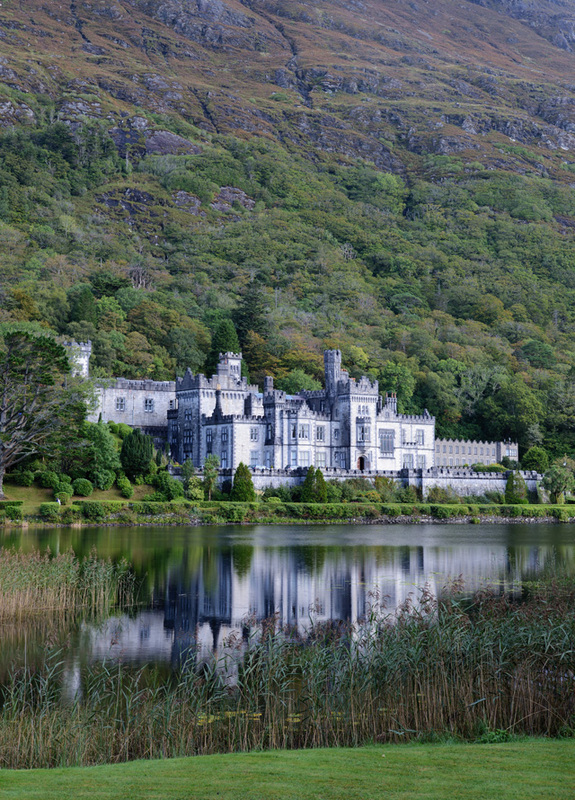 Notes: Kylemore Abbey is a Benedictine monastery founded in 1920 on the grounds of Kylemore Castle, in Connemara, County Galway, Ireland. The abbey was founded for Benedictine Nuns who fled Belgium in World War I. The current Mother Abbess of the Benedictine Community is Mary Margaret Funk. Kylemore Castle was built as a private home for the family of Mitchell Henry, a wealthy doctor from London whose family was involved in textile manufacturing in Manchester, England. He moved to Ireland when he and his wife Margaret purchased the land around the Abbey. He became a politician, becoming an MP for County Galway from 1871 to 1885. The castle was designed by James Franklin Fuller, aided by Ussher Roberts. Construction first began in 1867, and took one hundred men four years to complete. The castle covered approximately 40,000 square feet (3,700 m2) and had over seventy rooms with a principal wall that was two to three feet thick. The facade measures 142 feet (43 m) in width and is made of granite brought from Dalkey by sea to Letterfrack and from limestone brought from Ballinasloe. There were 33 bedrooms, 4 bathrooms, 4 sitting rooms, a ballroom, billiard room, library, study, school room, smoking room, gun room and various offices and domestic staff residences for the butler, cook, housekeeper and other servants. Other buildings include a Gothic cathedral and family mausoleum containing the bodies of Margaret Henry, Mitchell Henry and a great grand-nephew. The Abbey remained in Henry's estate after he returned to England. The castle was sold to the Duke and Duchess of Manchester in 1909, who resided there for several years before being forced to sell the house and grounds because of gambling debts. In 1920 the Irish Benedictine Nuns purchased the Abbey castle and lands after they were forced to flee Ypres, Belgium during World War I. The nuns, who had been based in Ypres for several hundred years, had been bombed out of their Abbey during World War I. The nuns continued to offer education to Catholic girls, opening an international boarding school and establishing a day school for local girls. They were forced to close the school in June 2010. The Estate includes large walled Victorian Gardens. Since the 1970s these have been open for public tours and 'nature' walks. The Benedictine community has restored the Abbey's gardens and Cathedral with donations and local artisans in order to be a self-sustaining estate. Kylemore Abbey & Victorian Walled Gardens, Connemara, County Galway, Ireland.